There is nothing like walking through the woods on a crisp fall morning. The trees are in their full fall colors, the air is crystal-clean and all you can hear is the faint whispers of birds. It's the perfect morning for fall grouse hunting. We have a high population of grouse and the grouse grow big. There are many paths, ATV trails and old logging roads to walk down where you will see grouse. The most common upland game birds in our area are the Ruffed Grouse, Spruce Grouse and Sharp-tails. These birds are generally found in different terrains, which we have. 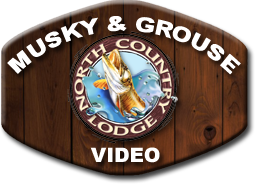 We do offer a grouse-hunting package.